Concussions are a tricky injury to recover from. Any time a person has suffered a head or neck injury, the signs of a concussion should be something to look for. Even if the symptoms of a concussion do not initially appear, symptoms of post-concussion syndrome may set in, revealing that a mild traumatic brain injury (mTBI) had, in fact, occurred. What can you do to care for a concussion successfully? We are going to provide you with some tips for finding natural relief that will hopefully be able to minimize any of the long-term effects of this type of injury. The first thing to do after a head injury is to make sure the injury does not become worse by resting. Any further strenuous activity can cause the damage to grow worse, thereby increasing symptoms and their long-term effects. It is important to sleep well at night as well as to nap during the day as needed during the first few days of the recovery process. Be sure to put any activities that could result in additional injury on hold. For example, an athlete would avoid playing sports until symptoms have gone away and a doctor approves returning to the playing field. This can take anywhere from several days to several months depending on the extent of the injury and how well it is cared for. Initially, this will mean ice. Icing the injury will reduce inflammation. This will decrease pain and should allow you to avoid taking any more over-the-counter painkillers than absolutely necessary. Once the swelling has gone down, it is important to see if the injury led to an upper cervical misalignment. Subluxations of the atlas and axis are common when head and neck injuries are involved. An underlying misalignment can extend recovery time and may even lead to headaches, vertigo, difficulty sleeping, and other symptoms of post-concussion syndrome. How can such a misalignment be corrected? Upper cervical chiropractic care may help. This is a safe and gentle subspecialty of chiropractic that is perfect when you are recovering from an injury and don’t want your neck popped and twisted. Low force corrections gently coax the atlas and axis back into proper alignment. This, in turn, allows proper blood flow to the reach the head and takes pressure off of the brainstem. Thus, the central nervous system can function optimally, and natural healing can occur. For patients who suffer a head injury, especially if symptoms are lingering, this is an important place to look for long-term relief. Rest is extremely important, but time doesn’t actually heal all wounds unless the underlying issue is resolved. Light activity – Start with relaxing activities at home. Return to school or work gradually. Don’t partake in activities that could cause further injury or make the existing injury worse. Reduce your daytime naps but be sure to continue sleeping well at night. Moderate activity – Begin to return your normal activities. If headaches or other symptoms return or grow worse, stop the activity that causes the issue. Return to a regular schedule of work or school. Regular activity – Once your symptoms are gone and you don’t see a sudden return due to any of your normal activities, you can go back to your regular daily routine, including sports and other physically strenuous activities. It may seem like a long road to recovery, but patience is the key to dealing with an mTBI properly. News reports regarding former football players and other pro athletes outline the importance of caring for concussions the right way. That means getting enough rest, caring for any underlying injuries, and returning to normally activities at a gradual pace. In these ways, you can combat concussions naturally and limit the need for medication. If you have suffered a concussion – whether due to a car accident, a sports injury, or any other type of head or neck trauma – contact an upper cervical chiropractor in your area. These subspecialists are in a unique position to be able to correct the underlying damage that could keep symptoms hanging on for quite some time. Since adjustments are gentle, they are safe and effective. Long-lasting adjustments give the body the time it needs to heal. Especially if you are an athlete, you no doubt want to hasten the healing process. That is the goal of upper cervical chiropractic care when it comes to concussions. 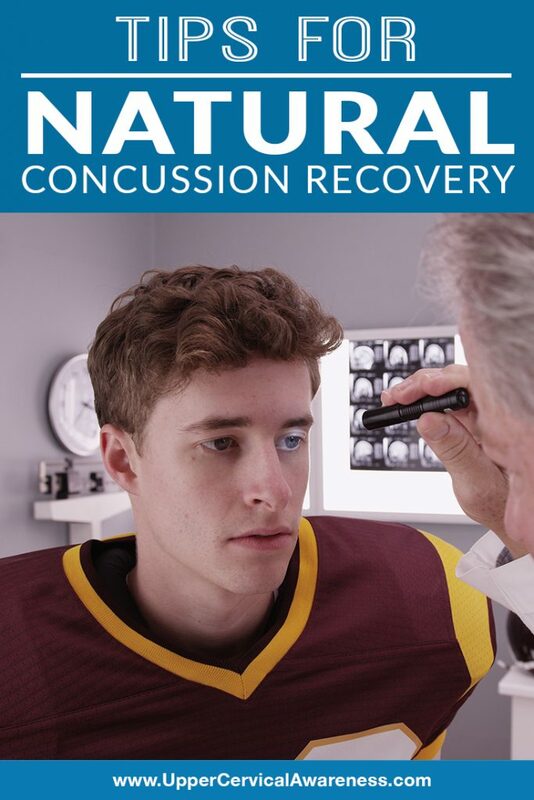 There is no such thing as a concussion cure. However, to ensure that your body heals as quickly as possible with minimal long-term damage, you want to be sure that the C1 and C2 vertebrae are in proper alignment. If you have suffered a concussion, use the search feature on this website to find one of our preferred doctors in your area. A no-obligation consultation can help you to learn more about the upper cervical chiropractic process and the benefits that you may be able to obtain through this unique subspecialty of care.